Optical fibers capture and redirect light to the plants during the day, while methane captured from organic waste can power lights at night. 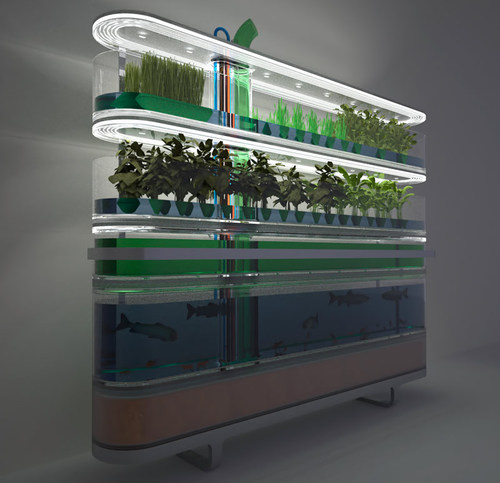 Sorry but you are using Aquaponics not hydroponics Googleaquaponics and you will find a great deal of info. Plus you will find out that not only vegies you will also get great seafood. This is cool. I’m doing a hydropronic plant experiment for a science fair. Hi, is this system ready for commercial sale? How can we buy it – more importantly, how can we sell for you? I live in a tropical country on the equator. Please email me more details! Thank you very much. I am very familiar to your concept, I also tried a very similar system except mine did not have two levels of plants simply because I can not control the growth of the plants on the second level, and I did not have a level for algae container. Algae became a problem in my case when it started growing in the fish tank and consuming the fish waste, the plants started showing the deficiency of nutrition. I used a vaccume filter to remove all the algae and added freshwater clams (which consume algae as a biological filter) in the fish tank that helped removal of algae and plants started showing healthy sign again. The use of Optical fibers to capture and redirect light to plants during the day is an interesting concept. Can you supply more details on this? Where to purchase how to deploy etc?